BRIAN WILLIAMS, anchor: President Obama is counting down the final hours of his family vacation in Hawaii . He returns tomorrow morning to a different Washington than the city he left. Our White House correspondent Savannah Guthrie with us tonight with a preview of what's to come in Washington . And, Savannah , starting with this, a lot of people have heard the Republicans say they want to bring up Obama 's health care plan, bring it back up for a vote to defeat it even though it's been signed, sealed and delivered. So how exactly will that work? SAVANNAH GUTHRIE reporting: All right, House Republicans say not so fast. They intend to hold a vote next week, they've announced, to repeal the health care law outright. Now, this will likely pass the House because Republicans now control the House starting this week. It will not pass the Senate . And, of course, the president has his veto pen. And you get the feeling here at the White House they're really relishing this debate, and because they think the health care law, now that it's gone into effect, has proved itself to be beneficial and a lot of people won't want to see those benefits go. Nevertheless, this is the new reality that the president faces. He returns tonight from Hawaii . Republicans will seize control of the House on Wednesday. The new speaker, John Boehner , will be sworn in, and there will be some symbolic gestures they're planning. House Republicans are to read the Constitution aloud on the House floor on Thursday. The president also has some staff decisions to think about. For one thing, some senior advisers, like David Axelrod , will be leaving. There's a possibility of a new press secretary. And NBC News has learned that the former commerce secretary under Clinton, Bill Daley , is being considered for a possible chief of staff role here at the White House . And then, Brian , there is a State of the Union to write, probably going to be later this month. Rep. Darrell Issa, R-Calif., on Capitol Hill in Washington on April 15. The Republican agenda for the 112th Congress that convenes Wednesday may have a greater impact on the 2012 elections than the lives of Americans in the next two years. 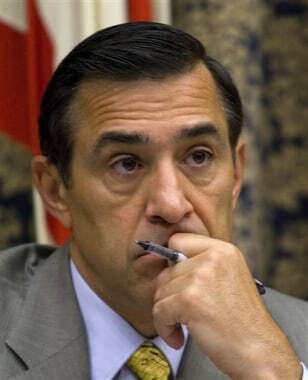 Issa, the chief Republican investigator, is anxious to get started. As the incoming chairman of the House Oversight and Government Reform Committee, he's been especially critical of what he calls waste in Obama's economic stimulus spending.